Pandemonium! It's Orange October in San Francisco! San Francisco has a case of Baseball Fever! The only known cure is heading to AT&T Park; or, watching the playoffs on TV. 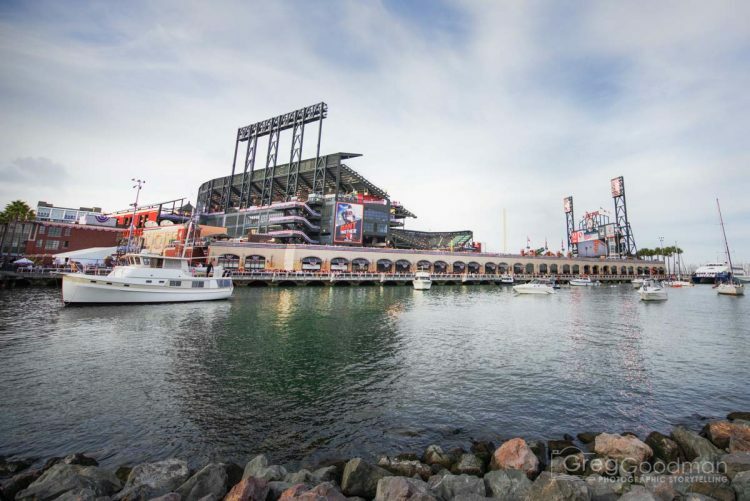 AT&T Park is located on McCovey Cove in the San Francisco Bay. To get the best photo, just walk across the third street bridge. Recently, postseason baseball in San Francisco seems like an annual event. The Giants won the World Series in 2010 and 2012. Sounds like the making of a dynasty to me! AT&T Park sees more than its share of clouds; but, the skies were especially magical for photography during Game 4 of the 2014 NLCS. Over the past five years, only two NL teams have played in the World Series: the San Francisco Giants and the St. Louis Cardinals. In 2012, the Giants beat the Cards in a thrilling seven-game NLCS. Fans attending the NLCS are given orange rally towels to spin around throughout the game. Barry Bonds – a local hero/villain – threw out the first pitch. A statue of Willie Mays greets fans as the enter the main AT&T Park entrance on Third Street. The Giants Win 6 – 4!!!! Game 4 of the 2014 NLCS was a wild one from the start. Neither starting pitcher had their best stuff; and, after three innings, the teams had combined for 13 hits and 6 runs. With my buddy Anthony, who hooked it with the tickets. Every Giants postseason game seems to involve some sort of comeback. Game 4 of the 2014 NLCS was no different. As I stood in my seat high above left field, the Giants rallied for three runs in 6th inning to retake the lead. The upper deck was shaking; as 43,000 fans jumped up and down, high-fived each other and cheered as loud as possible. By the time Hunter Pence popped out to end the inning, the score was 6-4. It was all the Giants would need. AT&T Park was rocking to the foundation during the Giants’ sixth inning comeback. Photographing baseball games and stadiums is one of my biggest passions. I especially love when teams roll out a giant American flag before important games. Over the past five years in San Francisco, I’ve been fortunate to attend several of these games. 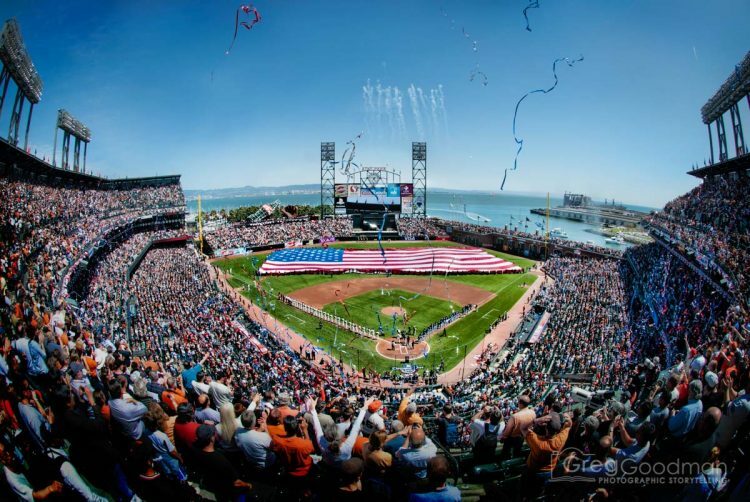 Below are my favorite photographs from home openers and playoff games at AT&T Park. My first-ever San Francisco Giants game was the 2010 home opener. 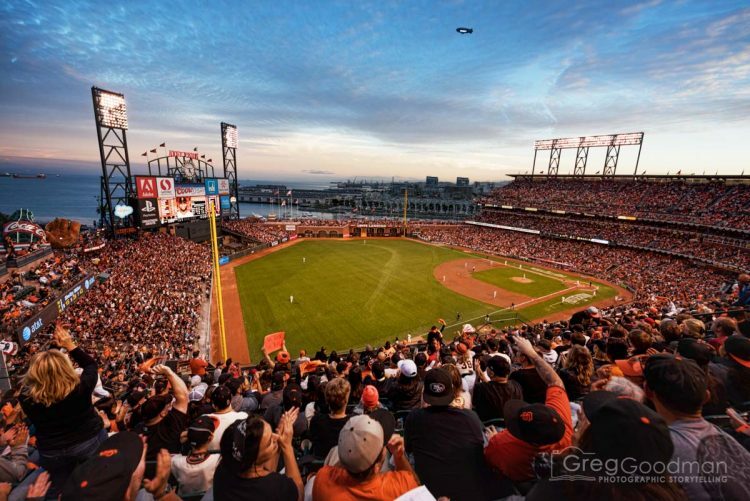 Want more San Francisco Giants photography? Below are links to my favorite experiences; each chock-full of photos and stories.